This remix of artist James Jean’s poster for the Avaaz People’s Climate March retains Jean’s focus on a girl holding a pinwheel, which now bears a shattered peace symbol, cut by bolt of destructive energy from above. In this revision, the pinwheel alludes to the way in which the false promises of “green” energy touted by non profits like Avaaz, are overshadowed by the global system that they ultimately support, a system which continues to exploit people and the planet in the name of economic growth and warfare backed profit. 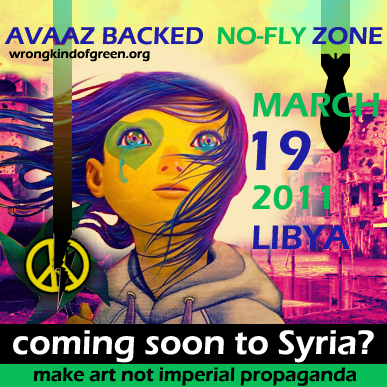 The light behind the girl symbolizes the explosion of bombs falling on the people of Libya, Syria, and other sites of US aggression, and those that may yet fall with increasing intensity in the event of the imposition of a no-fly zone in Syria, for which Avaaz is advocating. The precipice the girl is standing upon, a thin line between survival and total destruction, is the bombed out Libyan capital of Tripoli, which embodies the bitter reality of a world that is more interested in maintaining comfortable illusions than confronting difficult truths. Ironically, James Jean’s original poster design for the 2014 ad campaign was a winning entry in a contest initiated by Avaaz and co-produced by a group known as Art Not War. Will you please enlighten us why Avaaz is supporting the current global system? Because it is very much a part of the current global system. An integral part. It is essentially a product/creation of the current global system system itself. It’s job is to protect the current power structures that keep the current global system intact. It does this well.